. Why should I need to decide which piece of content is worth my attention? It really drives me nuts when these things aren't available in any way aside from shopping at a specific store. If I love a game enough, I find myself striving towards 100% completion. Odds are, if I pre-order a game I intend to love it enough to attain that completionist perspective. But here I stand, wanting to have every piece of L.A. Noire available; if I want to see, have and do everything possible in the game, I have to pre-order and purchase the title from four different outlets. I get the need to drive sales through exclusivity. But on a certain, terribly childish level, I hate being forced to pick and choose which store should get my money based on the goods they offer. 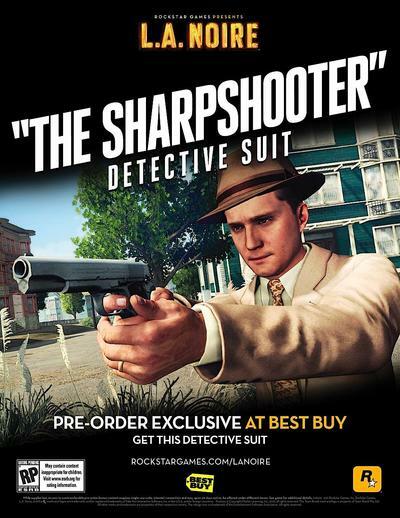 GameStop: 'The Naked City' Vice Case — In this bonus case from L.A. Noire's Vice Desk, detective Cole Phelps investigates the supposed suicide of a stunning fashion model. Can you help Cole unravel the truth in a city blighted by drugs, corruption and greed, where the death of a beautiful woman is never as straightforward as it seems? ; The Badge Pursuit Challenge — Hidden around L.A. Noire's beautiful recreation of 1947 Los Angeles are 20 police badges to find and collect. If you can find all 20 of these badges, the dapper Button Man suit will be unlocked which provides extra ammo for all weapons. Each badge also provides 5 additional XP which will help further unlock Intuition Points – special credits that can be used to give Phelps a key investigative insight when you need it most. Are you buying? If so, where?